Commercial Drone Market size in 2016 was over 100 thousand units with a market value of more than USD 2 billion, and is anticipated to grow at around 25% CAGR over the forecast timespan. Rotary blade drone market dominates the demand and includes both single and multi-rotor products used in a wide range of commercial applications. They have better rotor mechanism as compared to the fixed wing drone, thus enabling better flight control. Its superior features make it an ideal choice for several applications such as surveillance, photography, mapping and monitoring. Furthermore, rotary blade drone can also be used to deliver package with higher payloads. The commercial UAV industry is experiencing a phase of expansion with new trends and technologies taking a hold of the market, revolving around data. These include artificial intelligence powered UAVs and drone data, which enterprises access for making feasible and informed decisions. commercial UAVs systems are complex and therefore, machine learning and AI are used to study and understand the data to provide quick analysis and insights, as data alone is not enough to provide solutions. For instance, customers using cloud by Kespry, a computer software company, can reap benefits from detail-oriented roof models, inspection quality tools and images like automated hail damage detection. These tools aid in easy and fast generation of consistent and accurate assessments over the enterprise. Autonomous commercial UAVs market is estimated to gain substantial growth during the forecast period. They can operate on their own and does not require human intervention. They are powered by AI and advanced machine learning algorithms, which allow them to learn and get better with every flight. Their ability to perform hazardous task with higher accuracy and cost effectiveness is one of the major factors driving their demand. The increasing awareness of the benefits & features of the commercial UAVs and approval of government authorities, such as the U.S. Federal Aviation Administration (FAA), is one of the primary factor driving the commercial UAVs market growth. Inspection and monitoring applications are estimated to gain substantial growth during the forecast period. UAVs have been used in the management of various kind of infrastructure. Several industry verticals such as energy & utility, railways, roads can benefit from the technology for asset monitoring and inventory management. Their ability to perform hazardous work and acquire various data sets with accuracy and cost effectively is one of the major factors driving the demand of UAVs for inspection and monitoring purposes. Furthermore, real-time data provided by these devices is also one of the major factor augmenting the demand in inspection and monitoring applications. 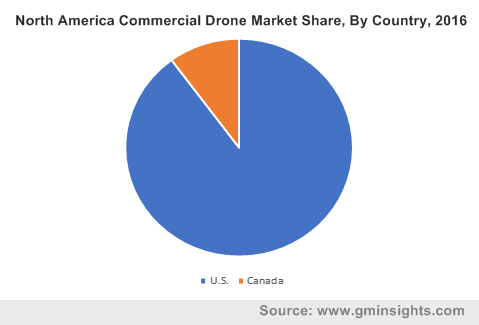 North America is leading the commercial UAV market owing to increasing adoption for innovative capturing and discovering of events through filming, video and aerial photography. The relaxation on the use of UAVs for commercial applications by the FAA is also estimated to contribute towards the growth of the market. Furthermore, supportive government initiatives also foster the growth of the market in this region. For instance, in 2017, the U.S. government launched a program to increase the testing of commercial UAVs to include nighttime operations, flights beyond the VLOS and flights flown over people. The program is said to expedite the integration of UAVs into the NAS and test UAVs tracking and detection, with removing few limits on their utilization. This program is estimated to have substantial impact on the growth of the commercial UAVs market. In additions, presence of a large number of players such as Aeryon Labs, 3D Robotics, PrecisionHawk is driving the growth of the market. 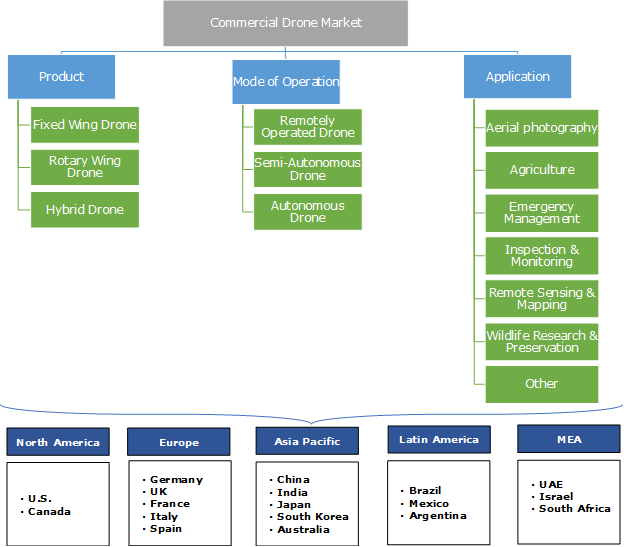 The commercial UAVs market is highly competitive due to the presence of a large number of UAV manufacturers. Some of the major players are DJI, Parrot, 3D Robotics, AeroVironment, PrecisionHawk, Yuneec International, Airobotics, Airware, Amazon Prime Air, Bae Systems, Cyberhawk Innovations Ltd., DroneDeploy, Ehang Inc., Hoverfly Technologies, Intel Corporation and senseFly. Mergers & acquisitions, product launches, technology licensing, collaboration and partnerships are some of the common strategies used by the players to gain market share and competitive edge over other providers. For instance, in February 2018, PrecisionHawk acquired AirVid and Droners.io to launch one of the biggest network of commercial operators in the world. The commercial UAVs market is growing exponentially with the advancement of technology and relaxation on regulation by the government authorities. The market has grown immensely in the past decade, with the start of an increasingly adoption and decline of costs since 2004. This has resulted in an increase of production. Furthermore, increasing use cases in industry verticals such as construction, retail, reUAVal estate and agriculture is augmenting the industry growth.